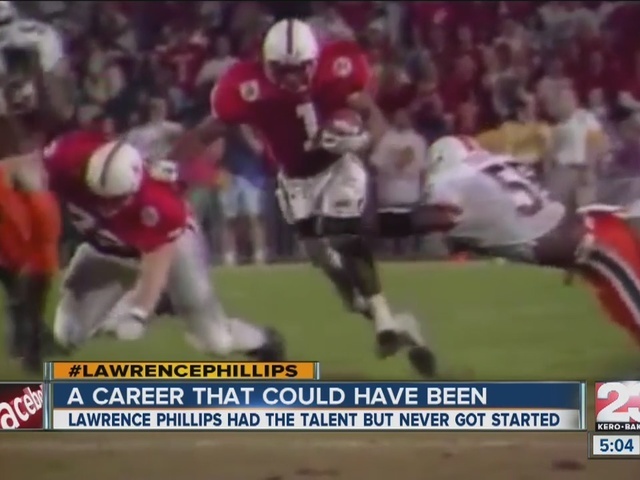 The Lawrence Phillips' story becomes all the more shocking when you look at what type of a player he was. Physically he might have been one of the best running backs in the history of college football. His sophomore year at the University of Nebraska he won the starting job and ran for more than 1,700 yards; still a school record for a single season. Behind his explosive running Nebraska ended the 1994 season undefeated. But following that success, his off the field problems began. Less than two weeks after being crowned a national champion Phillips was arrested for assault of his ex-girlfriend. His head coach Tom Osborne suspended him for six games but brought him back before the National Championship. "I'm working on i guess uh-becoming a better person and I'm definitely not going to let that mistake happen again," said Phillips before the 1995 Fiesta Bowl. Despite the controversy, Phillips shined scoring 3 touchdowns and winning a second straight National Championship. Shortly after Phillips declared for the NFL Draft and was selected 6th overall by the St. Louis Rams. Despite many questioning his moral character, others thought he could finally put his off field problems behind him. "Take the problems off the field away," said Joe Theismann an ESPN analyst at the time. "Everybody's called him the best player in the draft. You have to sooner or later let the talent go. This is not a league of angels." Despite rushing for 12 touchdowns with the Rams his off the field issues continued and he was released before playing two seasons. Briefs stints followed with the Dolphins and in Europe before he signed with the 49ers in the Fall of 1999. This time his on field play came into question when he missed a block that resulted in Steve Young's career coming to an end. Two months later he was released by the team. He went on to play in the Canadian Football League before he was let go for failing to meet the team's minimum behavioral standards. Just two years later his legal problems persisted before he was eventually convicted.